Time was when the Belfast Festival at Queen’s was the only show in town. Nowadays, Northern Ireland is awash with festivals, breathing down the neck of their sophisticated big brother and diminishing its exclusivity. But, over half a century on, the renamed and newly independent Belfast International Arts Festival, under the dynamic direction of Richard Wakely, is striving to reconnect across the city. This year, war and political uncertainty constitute major themes in landmark works such as Poppies: Weeping Window at the Ulster Museum, the sound installation Gardens Speak emanating from Syrian garden graves and Schaubuhne Berlin’s Compassion: The History of the Machine Gun. Replay Theatre Company taps into the teenage zeitgeist with John McCann’s high concept, high energy Dancing at the Disco at the End of the World (★★★). Designer Ciaran Bagnall creates a dystopian, post-viral, futuristic wasteland inside a vast, derelict Victorian warehouse, enclosing a chilling tale of survival and annihilation. Audiences are herded through the creaky building while director Janice Kernoghan steers a tricky course between the level of violence demanded by the textual content but restricted by the audience demographic. Performances are intensely physical and the script appropriately enigmatic until a climactic torrent of emotional exposition dilutes the dramatic tension. The Lyric Theatre premiered Fire Below (A War of Words) (★★★★), written by Owen McCafferty and directed by Jimmy Fay, the partnership behind the highly acclaimed Quietly. In this glinting, defiant one-hour play two affluent couples, subtly characterised by Ruairi Conaghan and Ali White, Frankie McCafferty and Cara Kelly, gather on a July evening to share a bottle of wine and observe, from a comfortable distance, the annual bonfire ritual in the loyalist estate below their gardens. The banter between them ebbs and flows, much of it directed towards the working class revellers. Layers of separation simmer, a loose thread from Quietly unexpectedly unravels and cultural differences are laughingly dismissed. Then a casual remark about the burning of a flag on the bonfire abruptly halts the laughter, provoking unpalatable and possibly irreparable reflections on a shared history. 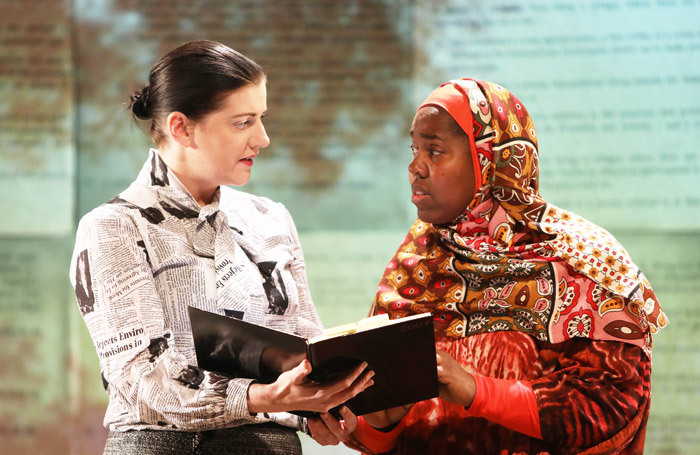 The little known plight of Somali asylum seekers in Ireland is laid bare in Rosemary Jenkinson’s Lives in Translation (★★★) at whose core is the real-life story of one woman’s tortuous ten-year struggle for official status. This important issue is presented by Kabosh in mixed-media documentary style, sensitively directed by Paula McFetridge. The well-chosen site is a former hardware store, indicative of the way in which the refugee industry reduces desperate lives to mere commodities. The central narrative is compelling and performed with controlled dignity by Raquel McKee, thereby raising the question as to whether it might have been more dramatically effective for it to be allowed to exist in its own right rather than with the addition of a diverse assortment of walk-on roles.